We are living in the middle of a perfect storm — or, at least on the front edge of it. It is a perfect storm of economic forces rapidly arising from the collision of swiftly changing consumer demographics and their profoundly world-changing demand for environmentally-sustainable and socially-just products and services. In a word, this is a perfect storm of hope. But it is also a perfect storm that could severely damage or even wipe out those companies and organizations who don’t clearly see the nature and direction of these changing conditions. If this perfect storm were to have a slogan, it would be: adapt or die. We live in a time when we may see the rapid demise of companies — some of them the largest in the world — should they fail in their ability to adapt. Baby boomers are retiring in droves, and with them the demand for toxic, excessive, harmful consumer products is diminishing. This is due to a combination of a reduction in their spending power as well as some of them “waking up” to reality, and to the power (and responsibility) we each wield through our spending decisions. Simultaneously, Generation Y (the “Millennials,” born 1980–2000) and Generation Z (born 2000–2012) are rapidly ascending to the apex of purchasing power. There are currently an estimated 75–83 million millennials in the United States alone! And by 2019, it is expected that Millennials will dramatically outnumber Boomers, if they don’t already. It is clear that people of all ages and backgrounds are awakening to the power of our consumer demand — a force that we can utilize to have positive impact around the world by purchasing products from environmentally and socially responsible companies as opposed to their laggard counterparts. Moreover, consumers are increasingly connecting the dots between purchasing decisions and personal health and well-being. Witness PepsiCo’s recent purchase of SodaStream — one of its harshest competitive critics — as people increasingly eschew the deleterious effects of corn-syrup laced, artificially-flavored and colored beverages, and choose much healthier options. This substantial shift in consumer purchasing patterns is being further accelerated by Gen Y and Gen Z. Markets are moving. Firms are responding — at least those being directed by leaders grounded in realism. And capital sources are also responding. As reported in the Harvard Business Review by Andrew Winston, Larry Fink, CEO of BlackRock recently stated in his Annual Letter to CEOs (2018): “Society is demanding that companies, both public and private, serve a social purpose. To prosper over time, every company must not only deliver financial performance, but also show how it makes a positive contribution to society.” BlackRock, of course, is one of the largest capital management firms in the world, with over $6 Trillion ($6,000 Billion!) under management. This is no joke… this is a perfect storm. There is a third factor driving this perfect storm — and accelerating it even further: in addition to the “demand side” shift in consumer preference for social and environmental sustainability, the best and brightest of Gen Y and Gen Z are increasingly selective about their employers. They want to apply their skills, talents and credentials at firms whose products and services are truly serving people and the planet as a whole. This creates an additional acceleration factor that will speed the demise of some companies while enhancing the competitive advantage of others: brain drain is real, and is flowing away from companies whose products are toxic, damaging, and exploitative, and toward companies whose products enhance health and well-being while enhancing the regeneration and stewardship of our world. We live in a time of profoundly challenging circumstances — a time in which hope is at a premium. Those companies whose leaders are seeing clearly, embracing their responsibilities, and demonstrating the courage to lead with an authentic, determined commitment to sustainability, are going to quickly earn expanded market share and profitability. The others, left behind of their own accord, will lose the same. This is great reason for hope — hope amid a growing storm. Hope that we consumers and workers will drive the change needed to ensure a future we can all get behind. And hope that leaders are increasingly seeing this monumental shift in the reality of the marketplace. Larry Fink sees it. Do you? There is a perfect storm of hope fast approaching — may these winds of change blow with great gusto! Aaron Perry is a consultant, author and speaker. He advises companies, municipalities and universities through his “CSO for Hire” offerings, and hosts a weekly Stewardship & Sustainability Podcast. 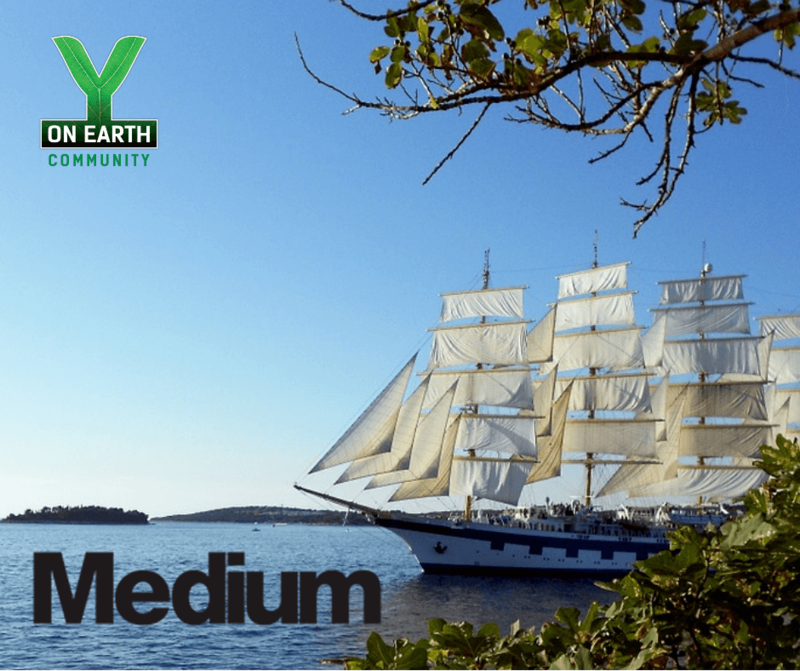 Sailing the Seas of Sustainability – How Good is Your Map?